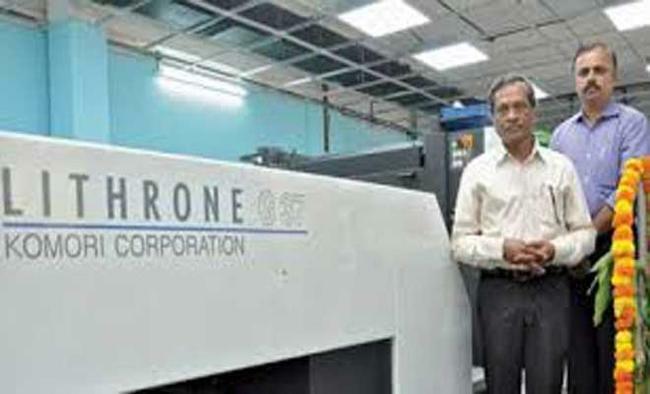 New Delhi: Tokyo-based Komori Corporation Ltd -- the third largest manufacturer of printing presses in the world -- on Friday announced the establishment of its India subsidiary that will introduce customised printing presses suitable for the domestic market. Komori is among the top two companies worldwide which are involved with currency printing for several countries, including India.A leader in offset presses, digital presses, Print Engineering Service Provider (PESP) products and banknote/security presses, Komori was till date operating in India via its sole distributor Insight Group. "With the launch of India office, Komori aims to strengthen and enhance Komori's presence in India and nearby countries. We are very excited to start our India operations," Hirofumi Hoshino, Managing Director, Komori India Pvt. Ltd, told reporters here.With the Insight Group, Komori already has a market share of over 40 per cent in the country and now aims to strengthen and scale its operations even further, not only in India but to other Asian countries too. "With the India footprint, we'll be able to provide the world-class quality and strong support to aid the Indian market. We will use the best of global and local processes to provide the highest value to our customers and maximize the customers benefit," he added. With the acquisition of Insight's Komori division, Komori India will retain the employees of Insight Group in its new team, the company said.Founded in 1923, the first Komori press for the Indian market was delivered in 1954. The machine exported was a full-size (37 inch/640 mm) single-colour press equipped with a stream feeder.